Bikes: Cannondale Slate and the rest don't matter anymore. Yesterday on my return city commute, I found an 18v Bosch impact screwdriver. It was obviously kicked to the side by a car tire and the battery was cracked, but it still worked. It got me to wondering. As cyclists, we have a pretty good view of the road, I'll bet people have found some interesting things lying in the street. What are some of the things you have found while riding? This topic came up about a month ago; some pretty interesting responses. Sorry, I did a search but nothing came up. Maybe a mod will merge the two threads. I didn't want to carry the Bosch either, and I can confirm that you can't carry it in a bottle cage, but I hung onto it for the 10 more miles I had to go. There's definitely already a thread for this but I'll take here. I'm traveling in Ireland and just found some slip-joint pliers and a local license plate on the side of the road (not in the same place, but on the same ride). These'll make nice souvenirs for the garage when I get back home. Overwhelmingly though, I mostly find tools. I think it's careless contractors/handymen that set tools around the exteriors of their trucks and then drive off without putting everything away. Back home I've found a mini sledge hammer, multiple wrenches (both box end and adjustable), sockets, tape measure, hack saw, small gas can, glass scraper... That's just what I remember. All of them were in good enough condition that I kept them and still use them. Found an empty wallet once with if and credit cards but no cash, made contact with the owner but strangely they didn't want it back so I destroyed the contents. Found plenty of loose bills on other occasions, totaling around $200 so far. The latest thing I found was an adjustable wrench, but it wouldn't adjust so I left it. Been awhile since I found something really good. Found a cell phone once that found out had been stolen at gunpoint upon contacting the owner. Best "keeper" find was a nice thick cable lock that still had the combination set for 0000. Ended up giving it to a friend who was needing a lock. There's been a few threads on this as well as things seen on your ride. We do find some stuff while riding. Found myself on the ground after I hit some black ice one dark morning. Yes, there was a similar thread a while back. But who cares? We have multiple tires/lights/clothing/rain gear threads, so why not a new thread for this? I don't see much of anything worth stopping for. Only decent thing that I kept was a disc golf disc (redundant?). But I haven't played in a long time and am not sure if I'll ever use it. Unfortunetely, what I usually find is glass and tacks that give me flat tires. Now when I run I find much more stuff and don't get flats. Money, camp stool, 2 taillights, 2 cell phones (returned them). Found a purse once. Picked it up and called the lady when I got home (didn't have a cell phone back then.) She stopped by my house and gratefully reclaimed it. Turns out she had set it on the roof of her car while she was loading her groceries, then drove off and forgot it was up there. The funny thing is I found it over a mile away from the grocery store. Not that it's any worse than any other garbage one might find but it ticked me off. I found a spent CO2 cartridge and tube with a hole in it. What a lazy jerk. Couldn't take 30 seconds to shove the tube and cartridge back into his pack or pocket. This was on a MUP so it wasn't a race or anything like that. But now I have another spare tube. I almost wonder if it wouldn't be worth moving it out of that sticky where more people could find and contribute. I do not commute but I am always looking for thing people drop from their walks, golf carts, and auto. Several ears ago as I was making a Left Turn I noticed a Silver Half Dollar that was imbedded in the pavement. A brand new Nissan wheel cover. But I didn't have enough ropes to tie it to my rack, so I left it. Once I saw what looked to be a brand new full-finger riding glove. I kept right on going, though, because I thought "What good is one glove? I'm not MJ." About a quarter mile down the road, I came across the other glove. I did the exact same thing with a Canon F-1 years ago. Fortunately, the car had a vinyl top so it stayed put, even as I was driving up a curved freeway entrance ramp. 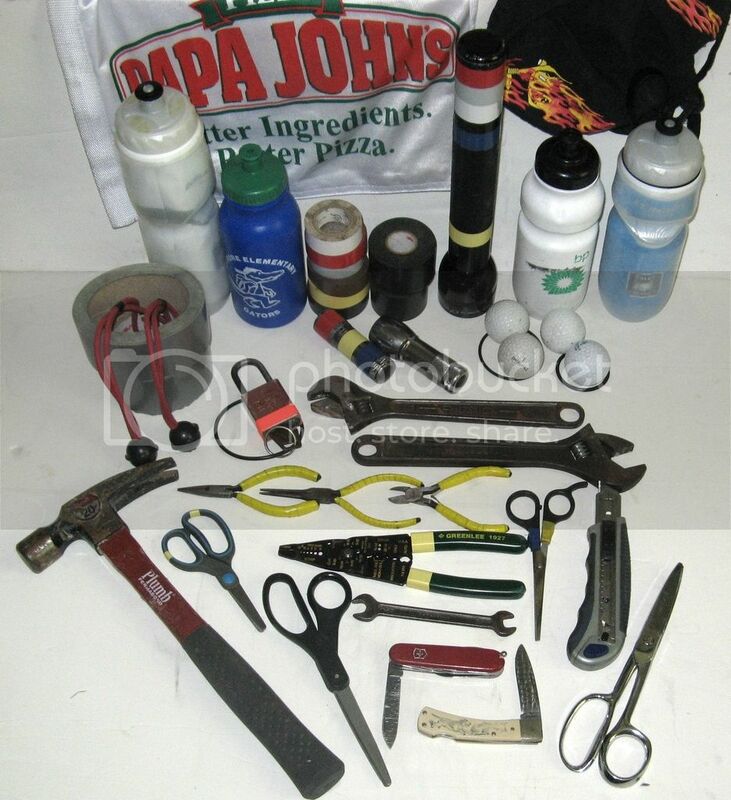 Pocket knives, 3/8" drive ratchet, numerous sockets, 2 or 3 combination wrenches, 100 foot tape measure, Bose QuietComfort 15 noise cancelling headphones (in almost new condition), numerous hats, shirts, a couple of sweatshirts, a Pearl Izumi windbreaker, a 1/2" drive breaker bar, a truck tire gauge (big one goes up to 120 PSI), probably at least half a dozen screwdrivers including a nice CAT rated electrician's screwdriver (I think they're around $30). A roll of blue tape that I'm still working on finishing (I use it as a print surface on my 3D printer). At least a couple of pair of pliers. 2 wallets, handed over to the police station. Never any loose money. I'm sure a bunch of other stuff. At least once a week I see something in a toolbox or on a shelf and think "I don't remember buying that" and then think "Oh right, I found that in the road about 5 years ago. I've pulled probably hundreds of nails and screws out of the road too, trying to save people's tires. I just picked up about 50 sharp finish screws out of the road last night.